A portrait of the evangelist Luke is one of the later pictures, painted on a separate leaf and inserted into the book. He is shown in the act of writing and above him hovers his symbol, the calf, shown as a bust with human shoulders and animal head. 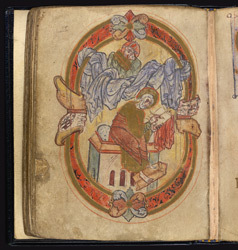 Its style differs totally from that of the original Irish St Luke miniature. Instead of the icon-like lone frontal figure, the late Anglo-Saxon evangelist sits upon a three-dimensional bench with footstool, a mass of drapery suspended across the frame above. The frame's deep colours and three-dimensional classical ornament of animal heads, acanthus and vinescroll, as well as the image within, show the style that was being adopted from Continental sources in this period of monastic reforms and theological renovation.